Wood County is one of National WIC Association’s Community Partnerships for Healthy Mothers and Children (CPHMC) project awardees. With their Healthy People Wood County Coalition, the Wood County Health Department is working on objectives in their community to both expand access to healthy and nutritious foods, increase access to quality healthcare, and improve access to chronic disease prevention, risk reduction, and management opportunities. The coalition’s great work in Wisconsin Rapids has earned them multiple spotlights in the media recently. See highlights and links to articles below. This article overviews the whole scope of Wood County’s CPHMC project, their objectives, focus and the great need for this work. Through increased promotion in farmer’s markets and grocery stores, breastfeeding policy work, and non-pharmaceutical prescriptions Wood County is working to improve their community with policy, systems and environmental changes. To read the full article, click on the thumbnail to the left. Congratulations to Wood County on these great successes – keep up the great work! On Saturday, October 22nd, the Loudoun Pediatric Obesity Coalition (LPOC) hosted their second “Healthy Living in Loudoun” day event as a coalition. Despite dismal windy weather, the event was a success with representation from 13 coalition partner organizations and 7 additional businesses in the county. Representatives from our Congresswoman’s office attended the event, shared pictures on their social media page, and requested to be added to our LPOC’s list-serve to learn more about our work. The healthy living fair was hosted by Shoppers Food & Pharmacy, a grocery store frequented by many WIC families in the county and known among WIC participants for it’s clear labeling of WIC items. Thanks to the hard work and active engagement of the store manager, LPOC was able to fill 200 reusable Shoppers grocery bags with food donated by the store to give out as goody bags for event attendees. The bags were stocked with cartons of chopped tomatoes and tomato sauce, sample bags of muesli and steel cut oats, healthy snacks, apples, oranges, bananas, bottles of water, kitchen supplies, and fliers for community resources. Nearly all 200 bags were given out at the event and the remaining food was donated to Loudoun Hunger Relief, a local food pantry and LPOC member organization. The schedule was jam-packed with outreach education on community resources including SNAP enrollment, cooking demos, entertainment, and giveaways. Every 20 minutes, attendees could participate in yoga, Zumba, and Fuel Up to Play 60 active games, and at the top of every hour, drawings were held for healthy living raffle prizes. To earn raffle tickets, the coalition developed a “Hunt for Health” passport that families could complete by visiting at least 10 vendors and either answering a nutrition trivia question at their table or doing a quick and fun physical activity. Other event successes included signing one family up for SNAP, providing information about SNAP and other community resources to many more families, providing flu shots, recruiting a new coalition member, and gaining more coalition support from local elected officials. The Sterling representative for the Loudoun County Board of Supervisors promoted our event on social media and even provided us with informational fliers to distribute in the goody bags. All in all, the event gave us an opportunity to develop a strong relationship between the coalition leadership team and the manager of Shoppers. In the future, we look forward to working with the grocery store, and other new community partners formed during the planning of this event, on more initiatives to encourage healthy living and increased food access in the region. The holiday season is a time to celebrate and get together with friends and family. However, celebrations are usually paired with festive food – and a lot of it! Despite what you may think, you can enjoy the holiday season, stay healthy, while keeping to your budget. In fact, there are accommodating meal planning, preparation, and recipe resources provided by the United States Department of Agriculture (USDA). For instance, this webpage, provides a multitude of recipes from State SNAP- Ed programs. In addition, the USDA created these WIC Works resources. This page incorporates heart healthy recipes, meals for small families, soup recipes, and meal planning, shopping and budgeting guidance. Another great resource is the Healthy, Thrifty Holiday Menu with SNAP-Ed Connection recipes. There are recipe ideas for every month of the year. For example, the month of December is comprised of multiple recipes for Hanukkah, Christmas, and Kwanzaa that are also delicious, affordable, and healthy. This webpage provides a recipe for every monthly occasion, and has vegetarian options, too. Beyond the USDA’s website pages, you can also check out the Food Hero webpage which contains hundreds of low cost recipes for families. All the resources included here include Spanish translations of each recipe and the nutrition label for the meal. Hopefully you can take advantage of these recipes this holiday season. We hope you have a very merry holiday season celebrating with your friends and family, and we hope you’ll be able to incorporate some of these great resources into your own festivities. Cheers from the CPHMC Team! Quinney Harris, Principal Investigator for NWA’s CPHMC Project, recently traveled to Denver, Colorado to attend the American Public Health Association (APHA) Annual Meeting. During his four days at the conference, he was able to network with other public health professionals and attend conference sessions that were both inspirational and informative. During the APHA Opening General Session on Sunday, conference attendees were greeted by APHA Executive Director Dr. Georges Benjamin, Colorado Governor John Hickenlooper, and two local speakers who shared achievements from local public health movements in Colorado. APHA Outgoing President, Dr. Camara Jones, spoke on the legacy of institutional racism in the United States and the attendant health disparities: a call to action for public health professionals to address racism and social determinants of health in their work. Cecile Richards, President of the Planned Parenthood Federation of America, closed out the general session with a moving keynote address that celebrated the advancement of women in society and highlighted the ongoing need to protect women’s rights and their access to healthcare services such as Planned Parenthood. • Inclusive, Local Hiring Toolkit for Hospitals. • Chris Kabel from the Kresge Foundation spoke about the role of community development organizations in public health, urging attendees to engage foundations and community development corporations in their work. Details on current funding opportunities are listed on their website. • The Council of State and Territorial Epidemiologists will publish a scientific writing toolkit later this month. • City Health: They will also be launching a data platform with accountability measures that will be useful for public health practitioners in the near future. These tools and resources can be used to support current program implementation efforts and to plan for sustainability. All five national organizations in the Partnering4Health collaborative had representatives at APHA who toured the Grand Hyatt Denver, the venue for the Year 3 Meeting that will take place in April 2017, and gave presentations during the concurrent sessions. Quinney’s presentation on Wednesday, November 2nd shared highlights from Cohort 1 of the CPHMC Project and showcased breastfeeding achievements made by coalitions in Virginia, New Jersey, Kansas, Louisiana, and Texas. Link to the presentation slides here. On August 12th the New London County Health Families Partnership (TVCCA) hosted a Community Forum on the state of breastfeeding in New London County, CT. We discussed the current status of breastfeeding in the county with a focus on normalizing and encouraging breastfeeding in the region. The State Department of Public Health presented data on how New London County compares regarding breastfeeding initiation and duration in comparison to the rest the county and in Connecticut. TVCCA’s WIC Lactation Consultant (IBCLC) discussed the nutritional benefits of breastfeeding and supporting mom post-partum and during breastfeeding. Our two county hospital IBCLCs discussed how baby friendly practices improve many child and mother outcomes, especially early breastfeeding success. A local Nurse Midwife/IBCLC talked about how her office made physical changes to support breastfeeding, and a Pediatrician outlined what she sees as the most challenging barriers of achieving breastfeeding goals. Connecticut’s Breastfeeding Coalition presented on one of their projects – recruiting businesses to be breastfeeding friendly. Lastly, our special guests, a local mom and dad, shared their successes and struggles through their journey of breastfeeding. The day ended with a Call to Action from our State Breastfeeding Coordinator, Marilyn Lonczak. Marilyn outlined how each sector can do their part to support breastfeeding in New London County. Attendees left with a charge to make positive changes in support of breastfeeding across the diverse population of our community, and all of our mutual clients. Overall, the day was a resounding success! As the conference was wrapping up there was a tangible feeling of excitement and support as we set out to transform New London County into a Breastfeeding Friendly community. Loudoun County Takes Anna-Maria AND Quinney Out for Tacos! In September, thanks to Loudoun County’s close proximity to Washington D.C., our CPHMC team was able to host both Anna-Maria, our program manager, and Quinney for a site visit. While the visit was remiss of outdoor adventures, it was full of meetings with key stakeholders in our community and, of course, good things to eat. The day started at Loudoun County’s central government center building where our sub-coalition team meets weekly to discuss progress on our CAP. The week that Anna-Maria and Quinney visited, the team was excitedly reviewing the preliminary analysis of our WIC survey results. The WIC survey was designed by our team and was conducted over two months this summer at the local WIC agency’s two clinic sites; 191 families were interviewed, representing close to 12% of the local WIC population. Initial findings reveal that women are not meeting their breastfeeding goals and there is limited knowledge of vitamin D supplementation in our population. At this meeting was: Jennifer Brady the Project Coordinator for the CPHMC project, Dr. Janine Rethy the Physician Advisor for the leadership team, Dr. Sina Gallo from George Mason University, Dr. Gallo’s research assistant, Amara Channel Doig, and two GMU students: Michelle Apple and Raechel Eddy. Raechel is one of two nutrition students from GMU who is currently completing her 200-hour practicum with our team. Also, a special guest appearance was made by the Loudoun County Health Director, Dr. David Goodfriend. Following the meeting, we took a quick trip upstairs to show Anna-Maria and Quinney the permanent Nursing Moms’ lounge created for the Loudoun County Government before heading to lunch. Everyone was impressed with the design of the room as well as the amount of educational materials available for employees. Since the Loudoun County Government building is located in the historic district of downtown Leesburg, it is within walking distance to many great restaurants. A weeks long debate over whether to go out for soup (we all know how much Quinney loves soup!) or go out for tacos resulted in a trip to Señor Ramon’s Taqueria, one of our leadership team’s favorite places to eat. The empanadas from Señor Ramon’s were recently voted one of the best new foods in all of Northern Virginia! Lunch was delicious as always and we used the time to tell Anna-Maria and Quinney more about Loudoun County. Following lunch, we went to visit a coalition partner organization, Mobile Hope, an organization working to improve the social determinants of health for the most at-risk youth in our county. They serve children 24 years of age or younger who are at-risk, precariously housed, or homeless. Mobile Hope has a bus that goes out to seven different locations in the county twice a week to deliver their services, including everything from supplying basic needs items to assisting with Medicaid enrollment. Mobile Hope also has an amazingly well-organized and inviting warehouse where families can also access their services and “shop” for supplies: clothing, books, toothbrushes, food, and much more. Donna Fortier, CEO and Founder of Mobile Hope and Loudoun Pediatric Obesity Coalition member, took us on a tour of the facility and the bus and gave a very thorough description of the services they provide to our guests. Mobile Hope has been working closely with our leadership team to increase fresh fruit and vegetable access for vulnerable families and raise awareness of assistance programs available. This summer, Mobile Hope worked with LPOC members to become a part of the gleaning network in the county, and as a result, increased the amount of fresh produce they were able to provide as part of the bags of food they distribute on their bus routes. After being trained by our leadership team on assistance programs available in the county, Mobile Hope invited us to attend one of their monthly shopping nights where our leadership team was able to provide education to families on assistance programs and offer on-site enrollment. From Mobile Hope, we hopped in our cars and just a short drive away found ourselves at Loudoun Hunger Relief (LHR), a food pantry that provides fresh groceries to those in need in our county. We met with Erika Huddleston, coalition member and Associate Director of LHR, who gave us a tour of the pantry while telling us about what they do and who they serve. Last year, LHR served approximately 11,000 individuals through 73,000 visits and gave out over 1.2 million pounds of food! Erika told us that the food pantry is working hard to improve the nutritional quality of the food they provide and, on the day we visited, Anna-Maria and Quinney were able to see the abundance of fresh produce at the pantry gleaned from our local farmer’s markets. Loudoun Hunger Relief and the Loudoun County Health Department are currently partnering to find additional ways to increase access to fresh fruits and vegetables for vulnerable populations in the county. If the DC Metro area is known for something, it’s known for terrible traffic, so after visiting Loudoun Hunger Relief, Jennifer, Anna-Maria, and Quinney made a quick stop at a local coffee shop before our visitors got in their cars to head home and hopefully beat the traffic. I never found out how long it took them to make it back east, but I hope it wasn’t too stressful! We really enjoyed the privilege of having both Program Managers at our site visit and hope they will both be able to visit us again for any exciting happenings with the Loudoun Pediatric Obesity Coalition or for hikes in Shenandoah National Park. The Clinton County Health Department enjoyed the company and time spent with Quinney Harris, Project Manager for the Community Partnerships for Healthy Mothers and Children (CPHMC) grant, on October 6th and 7th. The weather was remarkable for this time of year! And the timing was perfect for fall leaf peeping. Our day started off by bringing together key CPHMC staff: Mandy Snay, Director of Health Planning and Promotion; Mary Lee Ireland, WIC Coordinator; Kelsey Barnes, CPHMC Project Coordinator and Bill Badger, Principal Account Clerk. A tour of our historic building followed allowing Quinney to meet Jerie Reid, our Director of Public Health. Quinney was also able to see our WIC Clinic and was impressed with the “Soup and Sandwich of the Month” board. The next adventure was a windshield tour of Clinton County. We visited the Plattsburgh Boat Basin to see the great views of Lake Champlain and the Green Mountains of Vermont in the far distance. Next, we stopped at the Plattsburgh Air Force Base, the oldest military post in the United States. We then ventured up to Clinton Community College (CCC), one of our local colleges and saw an even better view of the lake. We then headed south to Ausable Chasm. The chasm boasts 900 acres of land with various trails and activities such as tubing, rappelling, rock climbing, rafting, disc golf, hiking and biking. Despite the (very loud) construction work on the bridge overlooking the waterfall, Quinney was able to see just how majestic this location is. We then made our way to Dannemora allowing us to take in the colors of fall; red, yellow and orange. We showed Quinney the maximum security Clinton Correctional Facility where Richard Matt and David Sweat escaped in June 2015. Our little rural county quickly became national news! On our way back to town we stopped to check out the city beach which has seen a lot of development. With our stomachs growling, we stopped at Irises Café to grab some lunch. One of our coalition members and Director of the Interfaith Food Shelf, Dorothy Latta, joined us for lunch as well. Following lunch, Dorothy gave us a tour of the Interfaith Food Shelf. One of our project objectives is to increase food banks that sell healthy foods and/or expand their inventory of healthy foods in our target community. Food is purchased through the Regional Food Bank with ￼grant money from the New York State Hunger Prevention and Nutrition Assistance Program (HPNAP). In 2015, the Interfaith Food Shelf purchased or received approximately 264,508 pounds of food from the Regional Food Bank and received 102,922 pounds from community donations. Quinney was able to ask questions and see what the pantry has to offer. He was pretty amazed at the size of the pantry itself as well as the number of clients that it serves. This pantry serves about 1,800 people per month and 500-600 households per year. There is no financial requirement to come to this pantry, however, visits are limited to seven times per year. Each client fills out a card with their name, address, number in household and if they receive any benefits such as SNAP or WIC. To keep track of each visit, the date is filled in on the back of the card. This brought us to the end of our first day together. Friday morning started with a budget meeting with Bill, Mandy, Kelsey and Mary Lee. We discussed our Community Action Plan and discussed each objective in depth. After crunching numbers we needed a brain break so Mandy, Quinney and Kelsey went on a walking tour of Downtown Plattsburgh to see the historic monuments, farmers’ market site and walking paths around the city. We finished our final day together discussing our project’s next steps. Thank you Quinney, for coming to Clinton County, we hope you enjoyed your stay! Exciting things are happening in Kenosha Wisconsin as a result of the Community Partnerships for Healthy Mothers and Children (CPHMC) grant. Grocery stores are brainstorming methods to promote and highlight healthy foods. Farmers are providing suggestions on ways to increase the foot traffic at long-standing community markets with lively signage and evening hours. Representatives from physician offices, the Health Department, UW-Extension, Racine Kenosha Community Action Agency – WIC, and the YMCA are abuzz developing a non-pharmaceutical prescription pad to improve the health of Kenosha residents. K-HIP, the Kenosha Health Improvement Project is taking the lead on coordinating the activities which will bring about Policy, System and/or Environmental changes and ultimately make the Healthy Choice the Easy Choice. Quinney Harris, Grant Project Manager visited Racine Kenosha Community Action Agency (RKCAA) on Wednesday, August 10th . During his site visit, he had an opportunity to learn about the progress on the Community Action Plan (CAP), attend two work team meetings, hear how the CPHMC grant ties into current RKCAA and community initiatives, and tour the city with Tatjana Bicanin, K-HIP Facilitator. The day began with an early morning Workgroup #3 meeting to begin brainstorming on the non-pharmaceutical prescription pad to promote healthy eating, physical activity and mental wellness. Dr. Junith Thompson, an OB/GYN in the community is on the leadership team and an active member of K-HIP and Workgroup #3, is leading the effort to engage local physicians in the initiative. Her passion for WIC’s work to improve the health of young families through nutrition education, breastfeeding support, father involvement, and connecting families to health and community resources provides the medical community with information about WIC services from a medical lens. After the meeting, Tatjana introduced Quinney to Farmer Greg. Green Acres Farm is an on-site farm stand every Wednesday at RKCAA which provides WIC families and the community with an accessible opportunity to purchase locally grown fruits and vegetables with WIC FMNP checks, Senior Fruit & Vegetable vouchers, or cash. On the first windshield tour, Quinney met farmers at Columbus Park and Tatjana showed him the locations of the other community farmer’s market sites. A significant early success of the project has been an increase in farmers who accept WIC FMNP checks. Workgroup 2 led this effort by educating farmers about WIC and building relationships with them. Workgroup 2 also met on August 10th. Additionally, Quinney learned about the promotional work being done to inform Snap recipients about using their FoodShare card at Harbor Market and the new “double bucks” program. Harbor Market is Wisconsin’s second largest farmer’s market and hosts a variety of vendors every Saturday from 9am-2pm.A discussion occurred regarding the lack of access low income families face, and additional transportation opportunities have been proposed. In fact, Kenosha YMCA’s streetcar proposal from the Frank Neighborhood project to the Harbor Market was presented with a conversation on how K-HIP can assist with data and marketing. Possibilities abound for new on-site and in-store placement and promotion strategies for healthy foods at grocery stores, and Quinney’s second windshield tour highlighted local grocery stores participating in this initiative. Alana Perez-Valliere, a WIC participant serving on the leadership team and Workgroup #2 is also a Nutrition Educator through UW-Extension. She is bringing valuable insight into strategies that will be effective for busy WIC families. The team is regularly communicating with the store managers and store dietitians to develop strategies that can be sustainable and achievable at the local level. Their enthusiasm and willingness to explore opportunities will be a win-win for the stores and the Kenosha community. Over lunch at the Waterfront Warehouse restaurant, Quinney had an opportunity to converse with community partners and RKCAA staff who are committed to PSE work that will improve access to healthy food and beverage options and increase the number of people in Kenosha County with improved access to opportunities for chronic disease prevention/risk reduction/management through community and clinical linkages. Although the project period for Cohort #1 sub-recipients is complete, many of the projects have continued to prosper. The updates shared by these sub-recipients show the long-term impact the CPHMC project can make on a community. We applaud all sub-recipients for their efforts in the CPHMC project. Prior to the end of the project, Gateway Community Action Partnership (CAP) reached out to the Women's Care Center (WCC) at Cooper Hospital, an outpatient OB/GYN clinic, to develop a cross-referral system. They discussed various ideas and strategies and quickly realized they were both equally passionate about signing moms up for WIC. Through their partnership, they posted flyers promoting WIC’s presence at WCC. Eventually, a WIC staff member began visiting WCC on a monthly basis to distribute WIC and breastfeeding information. One of the goals for Gateway CAP through the CPHMC project was to minimize the travel for moms who receive WIC benefits by providing WIC services at their healthcare provider's office. WCC has fulfilled that goal by providing WIC with a private room for a nutritionist to certify and sign moms up for the WIC program. In the meantime, Gateway CAP is diligently working to reach their community through this partnership with WCC. Angelina County & Cities Health District (ACCHD) has received approval through a grant opportunity to continue running digital billboards. They will also continue their projects through a TxHealthy Communities grant they received. Their efforts have not gone unnoticed. The Department of State Health Services awarded ACCHD the silver award for their efforts to promote a healthy community in their county. In District 10 Health Department, the Healthy Families of Oceana County (HFOC), a community coalition formed through the CPHMC project, received an 18-month grant from the Oceana County Community Foundation for $7,500. During this time, they plan to distribute family resource bookmarks and healthy shopping guides, implement healthy shelf labels in Spanish, provide fresh milk and nutrition education to the Bread of Life Pantry families, continue the farmers’ market, and distribute a recipe book. HFOC has also received a grant to implement a ball pit and tobacco-free park signs. They look forward to continuing to make an impact in their community. East Side Health District has received a mini-grant from the YMCA to continue their Make Health Happen Healthy Corner Stores Initiative. They have also partnered with nursing school students to begin surveying churches on their health and wellness policies and activities. After collecting data they will begin promoting health in local churches based on the survey responses. St. Tammany Parish Hospital has incredible sustaining projects, as well as new projects in the making. They have developed a prenatal group nutrition program where OB’s can refer patients, and where high-risk pregnant moms will be referred to the dietitian for individual nutritional counselling. Additionally, St. Tammany Parish Hospital will be developing a nutritional program at a local health club as part of a weight loss challenge initiative. This includes pop-up grocery store tours, food demonstrations, and events with local restaurants for “Eat Fit” Program nights. Many of the projects that St. Tammany Parish Hospital began during the CPHMC project have continued to thrive. The Eat Fit Northshore program requires the collaboration between a nutritionist and local grocery stores, restaurant owners, and chefs to develop food items to fit within the Eat Fit criteria. This criterion comprises reduced calories, sodium, saturated fat, trans fat, sugars, and refined starches. St. Tammany Parish Hospital Eat Fit Program holds store tours once a month, cooking classes, and partners with the American Diabetic Association to participate in “Healthy Lunch Day” on November 15. They hope to work with the Mayors of St. Tammany Parish to declare this day as “Healthy Lunch Day” for the entire parish community. A big success happened in one of the supermarkets involved with the store tours, where a dietitian was hired to support customers during store tours and during shopping in general. St. Tammany Parish Hospital has sustained their breastfeeding initiative to include a “Breastfeeding Corner” in their hospital conference room not only for moms involved in the breastfeeding support group, but for all moms in their community to utilize. This effort is part of their plan to become a baby friendly hospital. Lastly, St. Tammany Parish Hospital continues to teach WIC participants at their Community Wellness Center Garden as they plant fall crops and teach along the way with a Master Gardener at some of the classes. Their YMCA garden site is continuing to flourish and will continue planting in the fall. Recently, The Five Sandoval Indian Pueblos were awarded, among other Native tribes, a new grant that aims to encourage Native children to drink more water and reduce their consumption of sugary-sweetened beverages and promote breastfeeding. This will be a community-led process over a two-and-a-half year period to successfully identify and implement a policy or system change effort in their communities. The Five Sandoval Indian Pueblos specifically have a goal to decrease the prevalence of sugary beverages in the WIC community in favor of water, plain milk, herbal and traditional teas. They also seek to improve breastfeeding acceptance by employers in the community. Sustainability success stories like these are a true testament to the passion and perseverance put forth by the sub-recipients in the CPHMC project. We look forward to more success stories such as these!!! Five Sandoval Indian Pueblos says “Guwatsi hoba!”* to Quinney! For two days in mid-July 2016, FSIP welcomed Quinney Harris of NWA back to New Mexico to visit old friends, make new friends, and certainly to make new memories. Wednesday the 13th the CPHMC project team met with Quinney at the FSIP Main Office in Rio Rancho. Mary Ann Bormann, consultant to NWA for the CPHMC project, was able to join us as well. We started with a tour of our main office, which took about 10 minutes because when we say we are “space challenged” it’s an understatement! We then had a meeting so that Quinney and Mary Ann could meet our Executive Director Joshua Madalena, Karen Greigo-Kite, FSP WIC Director, Mannon Garcia and Sia Argeanas from our “Get Fresh – Get Healthy” leadership team, and Thomas Swendson, a member of our Coalition. Mr. Madalena expressed his thanks to NWA for this opportunity, and voiced the full support of Five Sandoval for the project. Gail and Joshua updated the team on a meeting held the day before with the Director of the Jemez Community Development Corporation to discuss their plans for updating and expanding the Walatowa Convenience Store and space for a seasonal farmer’s market. FSIP is cooperating with Walatowa Convenience Store to ensure a stable source of fresh fruits and vegetables. We then went to lunch at Santa Ana Café at the Santa Ana Golf Course – a very comfortable space serving Native American inspired foods. The Native flute music was perfect background noise to the continuing discussions and information sharing, and the view of the Sandia Mountains from the tall windows was relaxing. After this break, the Leadership Team and Quinney moved to the FSIP WIC Office to continue discussions and updates for the project. Although Quinney originally had asked for a one-day site visit, we couldn’t let him leave without experiencing Pueblo cultural activities in person. July 14 is the Feast Day of Pueblo de Cochiti, in honor of their patron St. Bonaventure, and so on Thursday morning we headed out 35 miles to the town of Cochiti Lake, the Cochiti Lake recreation area and Pueblo de Cochiti, where approximately 1000 of our members live. First stop was the Cochiti Mini Mart. This is a Pueblo-owned Convenience Store that we have targeted to pursue WIC Vendor status and also to expand their inventory of fresh foods. We also hope to decrease the amount of sugar sweetened beverages and high salt / sugar / fat snacks available in the store. Due to the Pueblo Feast Day, the store manager, George Brooks, was there at the Pueblo overseeing the food service, and we planned to catch up with him at the dances. Next stop was the new Cochiti Visitor’s Center and post office, where we were pleasantly surprised to see that - in contrast to the opening day in April - the contents of several of the upright beverage coolers (sugar sweetened beverages, caffeinated drinks and power drinks) had been replaced with bottled waters in all sizes! They listened! Our last stop was the Cochiti Pueblo Plaza itself, where the dances, activities and ceremonies were taking place. There were several thousand participants and onlookers on site. Sketching, recording, picture-taking, and any other means of audio or visual reproduction is prohibited within the Pueblo. The Pueblo de Cochiti belief is that when an experience is unforgettable, that the experience is maintained in one’s heart and mind, and cannot be reproduced unless experienced first-hand. This gives the opportunity to re-visit the Pueblo de Cochiti and bring friends and family to share those experiences. Native American feast days allow tribal members to come together in a renewal of their language, culture, and religion. Activities include pueblo dances, drumming and chanting. The beat of the drum guides the rhythm and footwork of the dancers, who are dressed in traditional regalia (never say “costumes”). For the dances, the women wear black dresses with colorful woven belts and tall headdresses and carry evergreen boughs. The men are bare-chested with ritual colored clay covering their faces and bodies, loin cloths with small animal tails or full pelts attached at the back waist, leather arm-bands with evergreen sprigs attached, leggings, and carry round rattles which sound like rattlesnakes. The drummers and singers dress in long pants, long sleeved shirts with bandanas around their heads, and several played hand-made Cochiti drums, ranging from 2 ft to 4 ft in diameter using long sticks with cloth or leather-wrapped ends. The dances are held in the central plaza which, like most of the Pueblo, is unpaved and has no shade. That day the thermometer in my car was 105 at 2:00 in the afternoon! The rhythm of the dance is high-energy, and each dance lasts 15 to 20 minutes and has specific religious/cultural meaning. It is amazing how much stamina and dedication is required for pueblo dancing. There were crafts and food vendor stands around the outside of the area, and I found out that Quinney really likes Indian Fry bread! After several hours of observing the dances, touring the vendor sites, and the Mission Church at the end of the Plaza, we gratefully returned to the air-conditioned car for the return trip to Albuquerque. It was great having Anna-Maria in Wisconsin to see the kind of work that has been done in Wood County and what we are embarking upon with the grant objectives. While we were able to do everything on our agenda, we also made some time to get Anna-Maria to the Dairy State Cheese Factory to try some fresh cheese curds – the real cheese curds that squeak when you chew them!!! On the first day, Anna-Maria got a tour of the Wisconsin Rapids area, as well as the history behind why Wisconsin Rapids is the city it is today. The Wisconsin Rapids area used to be a thriving area until the mills shut down. There are still two mills operating, but with fewer employees than in the past. The mill jobs were well paying jobs and when they shut down many left the area, resulting in business closure, loss of jobs, and house foreclosures. There are many organizations working to make Wisconsin Rapids a great place to live again. We took Anna-Maria on a tour of the Tribune Building that is being developed by Incourage Community Foundation. The Tribune Building will be a place for those of all ages in the community to gather to socialize, engage in physical activity, and enjoy local foods. The purpose of the work that is being done in South Wood County is to keep people in the community. We want to make it a place where people want to live and work, especially for those who go off to college to feel it is a safe and healthy place to start a family. With this we need to ensure residents are healthy, active, and thriving. Many partnerships were developed prior to the grant, but have been strengthened through the work we are doing. We are also establishing new partnerships. During the site visit, Anna-Maria was able to attend the South Wood County Hunger Coalition meeting where our chronic disease coalition established a partnership at that time. We toured the Family Birth Place at Aspirus Riverview Hospital, where our breastfeeding policies will be put into place, and showed Anna-Maria the recent progress. We also toured one of our local farmer’s markets, but it was much colder than expected for July so we cut the tour short. During the site visit, we scheduled a partner luncheon and partner meetings to talk about the great work that is happening around chronic disease prevention and the work that there is to come. Anna- Maria was able to meet the CEO of the YMCA and a farmer’s market manager that is tied to the health system. We discussed how the non-pharmaceutical prescriptions will have a positive impact on the community and how it impacts each agency that is partnering as a resource. The prescription program will encompass all aspects of health, and providers will be able to check off which method(s) of wellness prescribed. We have a firm foundation in Wood County, and the visit from Anna-Maria was important because she could understand our individual projects and approaches to our project objectives. Another vital aspect is that we have strong community partnerships that will allow us to succeed and sustain the grant work. We are hoping Anna-Maria will be able to come back by the end of the grant period to see the progress made by the end of the project. Anna-Maria Roache, ACOG Program Manager, visited Tri-County Health Department on August 15-16, 2016. Tri-County Health Department is the largest health department in Colorado, serving 1.4 million people in the three counties of Adams, Arapahoe and Douglas. We have 11 offices in a 3000 square mile area. Our target areas for the grant include Adams County which is the northernmost county with a population over 440,000 and the City of Thornton in the southeast corner of Adams County with a population over 132,000. Our Leadership team took part in the windshield tour with Anna-Maria including Jill Bonczynski, MS,RD, Nutrition Director, Judy Fowler, MS, RD, Project Manager, Jen Schneider, RD, IBCLC, Outreach Coordinator, Jeanette Ribota, WIC client, and Angela Gilmer, Certified Nurse Midwife. We first had a Meet and Greet with Anna-Maria at our Administrative Offices where she was introduced to several of our Nutrition Staff plus our Dietetic Interns ontheir first day of their Internship and had a quick tour.Then we headed out 25 miles north to our first stop at Immaculate Heart of Mary Stewardship Center food bank. This well organized center is supported by their 6600 parishioners. They provide 176,000 pounds of food a year which serves 11,000 people. Also within the food bank setting is a program to specifically support young pregnant mothers and their infants. Our nearest WIC clinic now has a presence there twice monthly to reach those eligible for WIC. We took a tour including a comprehensive explanation of the many offered services including resources, different food packages for different needs including homelessness and medical nutritional needs and met a few of their wonderful volunteers. We then went about 5 miles to the Stonehocker historical site which includes a WIC supported community garden. This community garden is the largest in the Adams County garden co-op and is cared for as part of collaboration between WIC and Senior Hub, particularly the Retired and Senior Volunteer program. Tom Rapp, director of that program and a driving force for the gardens, gave us an informative talk on the history of the site which includes the only remaining brick farmhouse in built in the 1800’s in Adams County.This garden alone supplied 817 pounds of fresh produce for WIC families, food banks, and other community members in need last year. Lunch was at El Jardin, a local Mexican restaurant with great food and a part of this community for over 30 years. Following lunch we went about 10 miles further north to another of our community gardens in the city of Brighton, a farming community. Brighton is located in a designated food desert by Census data in Adams County. Our 27J garden has been in collaboration with the Brighton 27J school district since 2010. This garden produced 1,142 pounds of fresh produce last year for the community. In addition, we visited Lulu’s Farm Market in Brighton which is surrounded by the fields of produce that supply that market. This farmer accepts WIC vouchers, SNAP, and just might start a mobile farm stand in other communities in our target area that are also designated as a food desert. Anna-Maria called this the highlight of her visit! Day 2 started with a meeting at one of the WIC clinics, Park Centre, which serves our target area where we discussed some of the challenges related to the creation of a billing system for breastfeeding counseling in a medical provider setting by an RD, IBCLC from the public health setting in Colorado. Following this we met with two different provider groups where we hope to create such a system. Anna-Maria was introduced to the Rocky Mountain Youth Clinic which is a Federally Qualified Health Center serving about 2,000 pediatric patients per month of which 80% are on Medicaid. In addition to a WIC office added to this clinic, it includes a Behavioral Health specialist, classes for both failure to thrive and overweight children, and its very own food bank. Within this setting we are looking at a system for billing for community supports provided by an RD, IBCLC. Next stop was the Women’s Health Group, an OB-GYN practice where Angie Gilmer, our OB-GYN representative on the grant leadership team, is a provider. This practice has about 25,000 active patients with 1,000 deliveries/year and 30% on Medicaid. We met with Deena Marchant, Practice Manager and Erin Marchant, Operations Manager to further discuss systems for billing related to breastfeeding supports provided by a community partner and RD, IBCLC. Our afternoon included a scheduled Bringing Health 2 U coalition meeting and our final review of the site visit. The coalition meeting included representation from Thornton City Council, Mack Goodman; Thornton City Government, Jaylin Wac, and Takami Peemoeller; Colorado State Representative, JoAnn Windholz; North Suburban Hospital community relations, Ellen Duran; Salud community clinic, Jessica Christensen; Adams 12 schools, Jill Collins; Adams County government, Esther Ramirez; and Immaculate Heart of Mary Stewardship Center, Theresa Kozney. Agenda items included a review of the status of the CAP and discussion of next steps. The coalition members participated in a gap analysis of participants and will invite identified missing partners. Following the meeting, Anna-Maria met with the leadership team for the final review and then headed west to see a mountain! The San Juan Basin Health Department (SJBHD), a local WIC agency involved in Cohort 2 of the CPHMC project, collaborated with other community organizations to implement farm stands offering free, local produce for the community, including WIC program recipients, at the Roberta Shirley Center, the only local Head Start Center that meets during the summer. SJBHD accomplished this by collaborating with the Garden Project of Southwest Colorado and Manna Soup Kitchen to provide a sufficient amount of local produce at the monthly farm stand. So far, between June and October, they have hosted 11 weekly markets, served 500 people, and given away an estimated 3,000 pounds of local produce to those in need. The achievements of San Juan Basin Health Department and their farm stands have not gone unnoticed. They were recently featured in The Durango Herald, a local newspaper. Click here to read what they wrote. Way to go San Juan Basin Health Department. Keep up the great work! Dunklin County Health Department welcomes Quinney Harris, Project Manager for site visit! Quinney Harris, Project Manager for the CPHMC grant made a visit to Dunklin County Health Department on Tuesday, August 16th. Quinney met with key staff members Kim Gurley, Project Coordinator; Lisa Johnson, Administrator; and Kim Hughes, Director of Nursing, prior to having a quick tour of the Dunklin County Health Department. Our first stop was to the Kennett Community Garden. Volunteers Freddie Graham and Woody Eller talked about the garden’s benefits to the community. Quinney also learned how so many people have donated to the community garden in order for it to thrive and become as big as it is. It is currently 7.5 acres at this time! Not only do volunteers and community members help take care of the garden, but others come to help from probation and parole that need to earn community service hours for passes. To earn badges, Boy scouts also try to help out with projects like building picnic tables for people to sit on while out at the garden to pick. In order to pick produce at the garden individuals are asked to give a small donation, or leave half of their pick to be given to others that are unable to get to the garden themselves, such as the elderly, the disabled or those in nursing homes. Various other civic groups volunteer time and donate to the garden as well. The next stop was at Caterpillar Clubhouse Daycare where we met with the manager, Kim Thompson. She was able to show Quinney some of the new items that the daycare was able to purchase with the grant money from Eat Smart Certified. Some of the main items purchased were the kidney-shaped tables that allow the kids to help themselves at the table. An adult is present to better help them show more interest in nutrition. Quinney was able to learn about some of the food items that are served and what some of the barriers are between the Eat Smart Certified guidelines and state funded foods. On our next stop we were able to show Quinney our Taste Buddies program through the University’s Extension facility, and let them observe a class that was learning how to eat healthy. Mrs. Sharon Sutherland was teaching the class how to make spinach roll ups. Taste Buddies helps to give nutritional education to daycares, school age kids, and even adults. Quinney was able to see how the kitchen was set up to show kids how to cook on electric or gas stoves, depending on what they had at their home, so they are comfortable when cooking at home. At lunchtime we had a Coalition meeting that Quinney was able to attend. During the meeting we discussed the mission statement that we are still working on and updates of our objectives. Quinney was able to meet several members from the coalition team, and to find out how each person/organization contributes to the team. After lunch we were able to visit Semo Health Network, a provider that serves some of our target population. 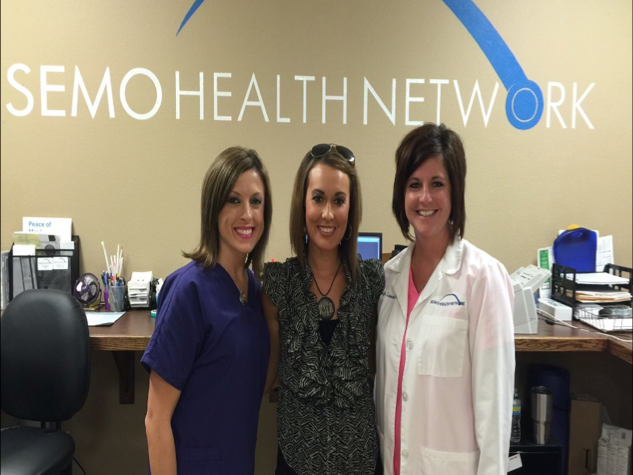 Semo Health Network provides services to low income families, and works with patients on a sliding fee scale. Quinney was able to talk with Jennifer Lawrence, NP, who is also on our leadership team, about the population we serve. She explained how we all try to work together within the community via networking considering the shortage of resources and doctors. Semo Health Network even has a grant to work with Harris Pharmacy so that the pharmacy can provide patients of Semo Health Network with low cost prescriptions, if needed. The majority of the patients Semo sees are Hispanic, so there is a cultural barrier there, but they provide Spanish-speaking employees to help translate. The next stop was to talk with some of the OB nurses at the local hospital, Twin Rivers Regional Medical Center, about breastfeeding implementation. Quinney was able to hear from Nicole Dunn, RN, in the OB department about how they are really trying to change the policy from taking the baby away from the mother after birth, to keeping the baby with the mother to get the skin-to-skin contact in order for the baby to latch on successfully. The goal is to help improve the breastfeeding rate that is currently very low at this time. Twin Rivers Regional Medical Center has identified a room to utilize for breastfeeding and plans to become a Breastfeeding Friendly Workplace. Dunklin County Health Department is providing 5 breastfeeding pumps and manual pumps to Three Rivers Regional Medical Center to help promote breastfeeding. Our Breastfeeding Peer Counselor at the Dunklin County Health Department also provides on-call assistance with new mothers. A window tour not only included the town of Kennett, but also Clarkton, Holcomb, Malden, and Campbell. Quinney was able to see many things in each place: the small garden Clarkton is growing this year, the Walmart in Malden that became Breastfeeding Friendly, fruit stands and peach trees in Campbell, and he finished his day with the leadership team at the well- known restaurant Strawberry’s in Holcomb, Missouri! Anna-Maria Roaché, with the American College of Obstetricians-Gynecologists (ACOG), arrived in Kansas City on Thursday August 11th for a whirlwind tour of our target neighborhood for the Community Partnerships for Healthy Mothers and Children grant. The visit began with a tour of one of the eight Truman Medical Center (TMC) WIC offices in the Kansas City metro. TMC-WIC is the largest WIC agency in the state of Missouri and in the greater Kansas City area. With multiple sites, often co-locating with community partners, the TMC-WIC program serves 11,000 participants per month throughout the city. Anna-Maria saw first- hand the 12345 Fit-Tastic! messaging at the WIC office, which highlights one of the ways the TMC-WIC program participates in the team’s Healthy Lifestyles Initiative (HLI), part of Children’s Mercy’s Weighing In coalition. Anna-Maria met with key staff from TMC-WIC as well as the Children’s Mercy to hear about the history of the partnership and how the grant interweaves with the work of the HLI and WIC to share a consistent message about health, while also implementing policy, systems and environmental change strategies within partner settings and the community. Rollin Grocer, a full-service mobile market, provides access to a variety of groceries in Kansas City’s “food deserts”. Our leadership team visited Rollin Grocer with Anna-Maria and discussed our work to support and build our relationship with this new partner in our community. After our meeting and tour of the WIC office, we visited Rollin Grocer, one of the key partners that the group is working with to increase access to healthy foods. Rollin Grocer is a new mobile market that targets mainly underserved communities in the KC metro. A full-service grocery store, Rollin Grocer provides a variety products, including high quality fruits and vegetables. While Rollin Grocer already accepts SNAP and is participating in a “double-up food bucks” program to improve access even further, they do not accept WIC at this time. Our team has met with the Rollin Grocer staff and is working with them and with the state WIC agency to determine how we might support Rollin Grocer to become a WIC authorized vendor. We are excited to see how the journey unfolds and hope to be able to make Rollin Grocer, a beacon for many in the city’s food deserts, more accessible for WIC participants. The next stop on our site visit was a large full service grocery store that accepts WIC, but is located outside of our target community. While the quality and variety of produce was excellent, the location, affordability and accessibility are difficult for WIC participants and others in the community. Next, we showed Anna-Maria several other partner organizations, such as a neighborhood association with a small farmers market and Harvest Learning Center Store, a small store with fruits and vegetables, located in a church nearby. These healthier food options are located on the border of our targeted zip codes, and we hope to broaden our reach to include these partners more in the work. As we crossed over the highway, Anna-Maria was able to see the barriers for many who are living in a “food desert” within our targeted community. While there are 3 WIC authorized stores in the area, none of them offer enough high quality, affordable produce to meet the needs of WIC participants and community members. Our site visit also included a stop at a local wholesale bakery outlet, called the Cakery. While not a full service grocery store, the location, affordability, cleanliness of the store and friendliness of the staff, as well as their deep commitment to the community, make it a place frequented by community members. The Cakery owners are very invested in the community and looking for ways they can support healthy and affordable food access. Through our coalition connections, we are working on how they might be able to start offering some healthy options and combine that with messaging/promotion and placement strategies. Next door, we showed Anna-Maria a primary care clinic that participates in the HLI through messaging, assessment and goal setting around healthy behaviors. We hope to use the grant to further institutionalize and build on the great work that is happening at Hope Family Care Clinic. Anna-Maria got to hear about the partnership that exists between WIC and Hope Family Care Clinic, as WIC co-locates in the clinic one day per week. Dr. Cymanthia Connell, the physician on our leadership team, is a former Hope Family Care Clinic physician and still volunteers there, as part of her commitment to the community. The Truman Medical Center Healthy Harvest Mobile Market made a special stop for Anna-Maria and our leadership team, outside of the Linwood Family YMCA on August 11th. The busy day ended with our leadership team meeting at the Linwood Family YMCA. Before the meeting began, we got a personalized tour of Truman Medical Center’s Healthy Harvest Mobile Market. Recognizing a lack of grocery stores in the urban core, the TMC Mobile Market began in 2012 to bring fresh fruits and vegetables at affordable prices to these underserved communities. The TMC Mobile Market has already taken the first step of sharing the 12345 Fit-Tastic! message, and we talked with the dedicated and passionate staff about ways this project and our coalition can further support them and the community members who visit the TMC Mobile Market. Above bins of fruits and vegetables, the Truman Medical Center Healthy Harvest Mobile Market highlights the 12345 Fit-Tastic! message, along with other tips and facts about healthy foods. Lastly, Anna-Maria was able to observe our leadership team meeting, see the progress we had made, hear input of the WIC participants and see first-hand some of the challenges we face in engaging community partners who are involved in our coalition work, but also involved in many other coalitions, meetings and initiatives in our large metro area. Our day ended with a quick tour of the Linwood YMCA, whose executive director, Stephenie Smith, is a key partner on our coalition and leadership team. Anna-Maria saw a visual of the community input that went into the plan for the newly renovated YMCA (under construction now) which will include an on-site primary care clinic, teaching kitchen, and many physical activity opportunities for community members. At the Linwood Family YMCA, Anna-Maria Roaché, with members of the leadership team: Darla Ketchum, Rachel Camp and Brenda Brewer (TMC-WIC); Shelly Summar and Emily Meissen-Sebelius (CMH); and Stephanie Answer (community member), smile in front of the 12345 Fit-Tastic! banner that greets community members who enter the YMCA. The Loudoun County Health Department, located in Northern Virginia, has been actively working to improve breastfeeding support systems available in the region in order to help mothers achieve their breastfeeding goals, and ultimately to increase breastfeeding initiation and duration rates in Loudoun County. As part of the Community Partnerships for Healthier Mothers and Children Project, the Loudoun County leadership team is focused on increasing the number of workplaces that develop and successfully implement breastfeeding policies as well as increasing the number of providers with training in breastfeeding support. This work has included implementing best-practice recommendations from The Surgeon General’s Call to Action to Support Breastfeeding (2011). The physician advisor on our team, Dr. Janine Rethy, a pediatrician and IBCLC (International Board Certified Lactation Consultant), has led these initiatives, and in the last several months, lots of progress has been made. One Action calls for providing education and training in breastfeeding for all health professionals who care for women and children. During National Breastfeeding Awareness Month, the Loudoun County Health Department completed and distributed a toolkit for community providers entitled: “Best Practice Breastfeeding Support Implementation Guide for The Outpatient Office Setting.” The toolkit was lauded by leadership of the Virginia Chapter of the American Academy of Pediatrics and added as a resource on their website. Another Action in the Call to Action is supporting mothers to have time and flexibility to breastfeed. Working closely with the Loudoun business community, including the County Chamber of Commerce as a key partner, we have engaged with businesses and assisted them in the evaluation of their readiness to implement breastfeeding policies in their workplaces. We created the Loudoun County Business Case for Breastfeeding Toolkit based on the US Health and Human Services Business Case for Breastfeeding and presented the materials at Chamber of Commerce events, Society for Human Resource Management events and directly to organizations and businesses. Outlining the benefits of creating a Lactation Support Program in the workplace, especially highlighting the 3:1 return on investments that businesses see due to things such as lower employee turnover and lower absenteeism, has been a key element in gaining the interest of local businesses. A notable success is the recent implementation of a comprehensive Lactation Support Program by the Loudoun County Government. This work has included creating a work team with the Loudoun County Government’s Department of Human Resources, Department of General Services, and the county’s health insurance provider. Dr. Rethy led the team to uncover details of the benefits that are available and mandated under federal law for working moms, create a workable system for these benefits, write an official breastfeeding policy, train the human resource staff, determine the most effective way to communicate with employees, create a designated nursing mother’s lounge in two county government buildings, and provide guidance on creating temporary nursing lounges in locations where a permanent room is not feasible. The culmination of this work resulted in a Loudoun County Government Lactation Support Program Policy made effective on July 1st, 2016, and a ribbon cutting for the permanent breastfeeding room held on August 8th, 2016. In attendance at the ceremony were many from the multi-sector team who worked on the project as well as local government officials. In addition, Jarene Fleming, the Virginia Department of Health State Breastfeeding Coordinator, was in attendance. The event received local media coverage as well as coverage from NBC4 Washington, a regional news outlet for the Washington D.C. area. All of these efforts initially gained the attention of Jarene Fleming when Dr. Rethy met with her at a Virginia State breastfeeding meeting in May. She praised Loudoun County’s breastfeeding work as being noteworthy for being the first comprehensive local government lactation support program implemented in Virginia, and for using a partnership with the local Chamber of Commerce to encourage businesses to adopt breastfeeding-friendly work policies. Dr. Rethy invited Ms. Fleming to visit Loudoun County in June to meet with key players in the local breastfeeding network and discuss Loudoun’s ideas for hosting breastfeeding trainings and recognizing breastfeeding-friendly businesses in the future. After returning again for the ribbon cutting, Ms. Fleming communicated her interest in using Loudoun County’s lactation support program as a model to take across the state. Over the next few months, the Loudoun leadership team plans to strengthen its partnership with the Chamber of Commerce in order to develop a plan for establishing criteria for designating businesses as breastfeeding-friendly and recognizing them with a Virginia Department of Health Breastfeeding-Friendly decal. The team is also planning a Certified Lactation Counselor training program for WIC employees and community health care workers for early 2017. And, on an ongoing basis, the team continues to offer support to other local businesses interested in developing and implementing breastfeeding policies in their workplaces. NBC Washington covered this story, read their coverage here. Tri-County Health Department is excited to welcome you all to Denver, Colorado, the Mile High City! Denver has much to offer you during your time here beyond the conference! Denver has artisan beer from Wynkopp Brewing Co. and great art at the Denver Art Museum and the Clyfford Still Museum. The History Colorado Center has interesting stories of the state, and you can get there on bicycle using the Denver B-Cycle system, then peddle over the bridge to Little Man Ice Cream. Don’t forget there are the Rocky Mountains to climb! For those of you not as interested in climbing mountains, there is Yoga in Civic Center Park on the Great Lawn Thursday evening near our State Capitol. Or see if you can find the Big Blue Bear! At such a beautiful time of year, Tri-County Health Department encourages you to explore all that Denver has to offer! New London County Healthy Families Partnership (NLCHFP) had their site visit with Anna-Maria Roache of ACOG on July 13th. It was a beautiful day to show Anna-Maria around our wonderfully diverse county. Anna-Maria stayed on Southeast CT’s shoreline where we hope she experienced the natural beauty of the coast before heading to our more industrial old mill towns and cities. We started off the day by touring our recently renovated New London WIC office, and then set off north, passed the Navy base and housing on our way to United Community & Family Services (UCFS) in Norwich. At UCFS we received a tour of their state of the art, full service Federally Qualified Health Center. The tour highlighted the facility’s inclusive medical model which offers primary care, gynecology, pediatrics, dental, behavioral health, laboratory testing, and pharmacy, all under one roof. After passing through Norwich and Montville, our next stop was the Gemma Moran Food Center. As one of Connecticut’s three food banks, this center receives local food donations as well as support from the state food bank based on local poverty levels. We were all amazed by the smooth and efficient way the Food Center is run. Our tour guide, United Way’s Vice President of Community Impact Dina Sears-Graves, was a wealth of information. Dina described their process and defined the current best practices they have established as well as future plans. It was also a wonderful opportunity to pick her brain about food insecurity in the county. We explored opportunities for future impact as well. Next we met with our ACHIEVE Coalition’s coordinator, Cindy Barry, in New London at William’s Park, the site of a weekly Farmer’s Market she coordinates through her latest FDA grant. Ledge Light Health District (where Cindy is employed) started the ACHIEVE coalition over five years ago and has since accomplished many healthy living goals in our county. To name a few, the coalition helped the city of New London achieve a bike lane, institute a no-smoking ordinance in the city’s parks, and supported the creation of new community and school gardens. Our NLCHF coalition is a subgroup of this larger coalition, working specifically on preventing chronic disease by supporting increased rates of initiation and duration of breastfeeding, addressing food insecurity, and improving prenatal care and birth outcomes. Lunch at Café NV was both delicious and educational. Many of our county’s key stakeholders – TVCCA’s COO MaryLou Underwood, Deborah Buxton-Morris and Leah Hendricks from the VNA, and Patrick Murphy, Community Health Center’s nurse manager, shared their regional health concerns with Anna-Maria. After lunch we convened the all-star breastfeeding coalition subgroup to discuss the strategy for approaching employers in support of our mission to increase the number of local businesses designated as Breastfeeding Friendly Workplaces. We had a rich discussion of the many factors to consider from the HR and legal perspectives, the woman’s viewpoint, and keeping the benefits to the employer (productivity, employee loyalty, etc) in the forefront of the conversation. Overall, it was a great time to reflect on all we have accomplished so far. We now look forward to the future relationships we will create and the healthy outcomes we will support going forward. Thanks to Anna-Maria for making the trip to New London County, Connecticut! ACOG Successfully Includes the CPHMC Project in ABOG’S MOC Process! The American Board of Obstetrics and Gynecology (ABOG) was founded in 1927 and is a nonprofit organization which certifies obstetricians and gynecologists throughout the United States. The ABOG Maintenance of Certification (MOC) process was created to enable physicians to maintain a high standard of current medical knowledge and safety. Each year, OB/GYNs must complete a specific set of tasks which include testing and performing a quality improvement activity. In order to engage providers in community based projects, the American College of Obstetricians and Gynecologists (ACOG) submitted an application with the hopes of including the CDC-funded Community Partnerships for Healthy Mothers and Children (CPHMC) project as a quality improvement (QI) activity for potential candidates for MOC. This portion, called Part IV: Improvement in Medical Practice, deals with the improvement of patient care through ongoing assessment and improvement in the quality of care in practices, in hospitals, health systems and/or community settings. Activities must reflect one or more of these outcomes: Improved patient or population health, improved access to health care, improved patient experience, and increased value in the health care system. Candidates who are renewing their certification have the option to choose the activity that best suits their practice, and their setting. ACOG saw this as a great opportunity to better connect OB/GYNs with community driven projects and therefore increasing community-clinical linkages. In order to be recertified, an OB/GYN will serve as an advisor on a community leadership team. They will participate as they are able in coalition meetings providing input. The OB/GYN on the coalition will also work with the community to increase the number of women who are receiving post-partum care, as well as primary care in order to reduce the instances of chronic diseases. After submitting an application to ABOG, the CPHMC project was successfully accepted as a QI activity for the recertification process for all OB/GYN candidates. The MOC recertifies over 5,000 OB/GYN candidates, which provides significant reach for this community based project. ACOG is happy to spread this work throughout its various channels, and is excited to see what the future holds for this project! This site visit was very valuable because Anna-Maria was able to see our community first hand. Anna-Maria was able to better understand our community needs when we went on a tour throughout West Warwick and was able to see first-hand the vacant mills that were once the backbone of West Warwick. The combination of the mills that have closed and the Station Night Club Fire, these incidents have really left West Warwick in a triadic state with only 1 grocery store in town and minimal business and job opportunities. We were able to show off our summer meals program that has just started that week. There were a lot of families that attended and seeing as it was the first week we were pleasantly surprised. We also went by the Thundermist Health Center to show Anna-Maria where some of our WIC 101 trainings will be held. Another stop we made was at the West Warwick Health Equity Zone where our Coalition meets once a month and Anna-Maria was able to meet and have lunch with Victor who plays a huge role in making our ideas come to life. Our CEO Paul was delighted to meet with Anna-Maria. It was the first time anyone from a grant has traveled out to see us and it really was such a treat for Westbay to have her here and hands-on.